My husband and I were on our honeymoon. We wanted to do a Mediterranean cruise as neither of have ever even been on a cruise before. I didn’t know what to expect. I have to say, I had so much fun and enjoyed almost everything! 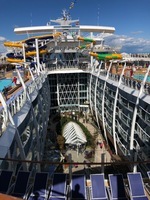 The ship is so breathtakingly huge and beautiful, it’s hard to not be taken back by it. It was clean and I loved the style and color scheme. Boarding the ship in Barcelona was a breeze for us. We were on the ship in probably 10 minutes. We had small luggage so we just took them to our room ourselves. When we first got on the ship, we were greeted with a free glass of champagne and it just looked and sounded like a party. So we went to drop the bags in the room so we could join in the fun. Our room was great. Clean, amazing ocean view with a balcony. I loved how we could be on the balcony and feel like we had total privacy. I never heard anything come from other guests in either of the cabins next to us. The bed was surprisingly comfortable and the bathroom was pretty basic. So we decided to get the ultimate drink package because we both enjoy having some drinks and based on my many years in the bar industry, I had a fairly good idea on about how much drinks would cost. Honestly, if you think you could/will drink at least 6 total alcoholic drinks for the whole day, You really need the ultimate drink package. If you figure per day, the package costs $60 (maybe $50, if you buy it before going on your cruise). The average cost for a beer or wine is $8 or $9 and without the package, you would still need to tip. With the package you get any drink that is up to $13 and gratuity is already included with it. It was drinking Grey Goose mostly but I never ran into a drink that went over that $13 limit. Barcelona was so beautiful and the people wear really friendly. I would highly recommend going to the bar Obama&apos;s and get a pornstar martini. So delicious! Do capri on your own so you can see the whole island on your time. The blue grotto was closed the day we went due to rough seas sadly but it is still just a stunningly beautiful place. Enjoyed seeing the colosseum and St Peter&apos;s Basilica it was just busy. I really didn&apos;t have a chance to really enjoy and appreciate the Vatican museum or the Sistine Chapel due to the insane amount of people in there. We were walking though as one big crowd, shoulder to shoulder, with no circulating air any any time you would want to pause to just look or take a picture, there was always security there to yell "Avanti, Keep Moving"